Sim Publishing produced a Christmas card for the 7th year in a row - this year an image of the word Peace covered in snow, with a snowy / starry sky beyond. A numbered limited edition of 80 cards was produced. The exhibition Eight B.C. 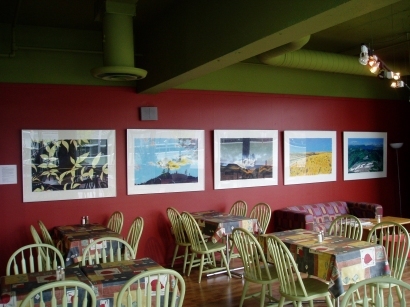 Printmakers will be on view at the Daily Grind Cafe Gallery, 1500 West Georgia Street, until January 17th. After review of the proposed work, sixteen B.C. prints were selected by eight B.C. printmakers - four 20th century, and four current. The prints show a range of methods and type of print, including woodcut, wood engraving, serigraph, linocut, and safety-cut blocks. There are black and white prints, colour prints, and hand-tinted or painted prints. 20th Century artists included in the exhibition are W.P. Weston, George Kuthan, Maisie Robertson, and Gordon Kit Thorne. Contemporary printmakers are Michael Kluckner, Pat J. Davitt, Andrea Taylor, and Gary Sim. The exhibition Eight B.C. Printmakers will be on view at the Daily Grind Cafe Gallery, 1500 West Georgia Street, from December 6th to January 7th. The exhibition will feature a selection of nineteen B.C. prints dating from 1928 to 2004, by eight B.C. printmakers - four 20th century, and four current. The prints show a range of methods and type of print, including woodcut, wood engraving, serigraph, linocut, and safety-cut blocks. There are black and white prints, colour prints, and hand-tinted or painted prints. Sim Publishing will have five original prints in the exhibition. 20th Century artists included in the exhibition are W.P. Weston, George Kuthan, Maisie Robertson, and Alistair Bell. Contemporary printmakers include Michael Kluckner, Pat J. Davitt, and Andrea Taylor. Contact information will be available for the contemporary printmakers, as they have a number of print editions for sale that would make great Christmas presents. Sim Publishing continues to add information to this flagship project. Release 1.10 was just issued, now containing 900 web pages of information on Vancouver's early art and artists. Sales of the project have picked up, and recent owners now include Simon Fraser University Special Collections and the Vancouver Public Library. Other institutional owners include the National Library and the National Gallery Library, Ottawa, and the Vancouver Art Gallery Library. Sim Publishing would like to thank everyone who has purchased the project or assisted in the huge amount of research needed to produce it. The Fall 2004 issue Number 136 of Amphora, the journal of the Alcuin Society, has been published. The featured artist in this issue is well-known B.C. artist Arnold Shives. 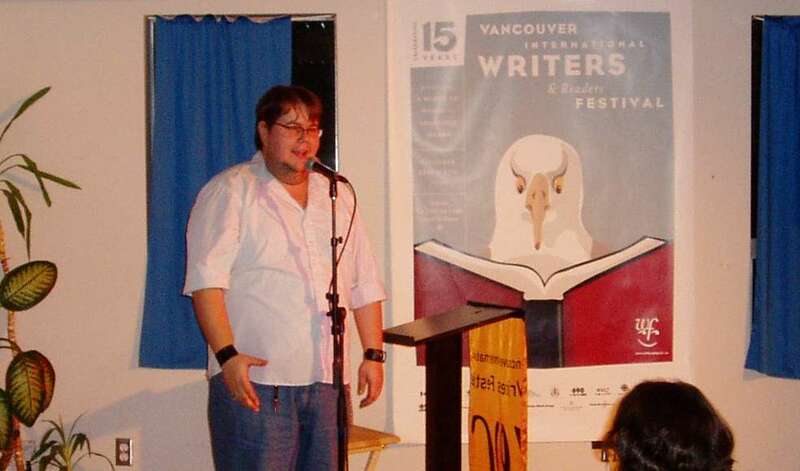 An article by Gary Sim about 10 years of volunteering for the Vancouver International Writers and Readers Festival is also published in the issue. Thank you again to the Alcuin Society for your excellent support of the book arts. In support of the Alcuin Society and their work, Sim Publishing donated two limited edition prints to the annual Alcuin Book Auction, held November 6th at the University Golf and Country Club. Prints OTTERS ON SAVARY DOCK and the new print WAITING were sold to appreciative bidders. Parallel.AT Services Inc., an architectural drafting and design company, has chosen one of Sim's Christmas card designs for their corporate Christmas card this year. Production of the cards will commence immediately, to be sent to all of the company's clients and consultants. Thank you. architectureBC, the journal of the Architectural Institute of British Columbia, published three pen and ink drawings by Sim in their Fall 2004 issue, accompanied by a short article. Drawings Public Art on Alberni Street, Nine O'Clock Gun, and Burrard Bridge are shown on page 15. Sim is an Associate Member of the Institute, and would like to thank them for the honour of having his work published in their journal. An article by Sim on the subject of the "digital drawing" is being written for the upcoming issue. This is a photograph that I took in 2004 at the writer's festival volunteer party. Shane brought the house down with a couple of performances during the festival, but a lot of the volunteers had not seen him perform. I was asked to M.C. the volunteer party, and had the idea that perhaps Shane would perform at the party. I got in touch with him, and he was happy to do so. Discrete arrangements were made so that it was a complete surprise. He arrived, and gave a long and wonderful performance, and then stayed around to party with us. It was quite a surprise to see him performing as part of the 2010 Olympic opening ceremonies! By way of personal thanks to the 200 volunteers who help make the Vancouver International Writers and Readers Festival such a success, Sim Publishing donated three prints for door prizes at the Volunteer Recognition Party following the Writers Festival. One print each of SHUCKING SHED, PRICKLY, and OTTERS ON SAVARY DOCK were drawn as door prizes at the party. As an additional treat for the volunteers, Sim Publishing also hired award-winning poet Shane Koyczan to read to the volunteers. Sim Publishing received word today that the National Gallery of Canada has acquired a copy of limited edition print SHUCKING SHED ( #5 / 30), produced by Gary Sim in August 2004. This is the first artwork by Sim acquired by a major gallery, and it is with great pleasure that we announce this acquisition by the National Gallery of Canada. Sim Publishing notes that Gary Sim has been listed in the National Gallery's database, Artists in Canada. A preliminary listing was posted some time ago, and will be updated in the near future following a recent donation of artwork, ephemera, and information about the artist. Artists in Canada is "a bilingual union list that identifies the location of documentation files on over 42,700 Canadian artists. Includes brief biographical information on the artist, such as dates and place of birth and/or death, and artist technique". It is a primary reference tool and finding aid for information on Canadian artists. Recently, following the death of Doris Shadbolt, art curator and wife of noted Canadian artist Jack Shadbolt (1909 - 1998), a large number of books and exhibition catalogues from the Shadbolt estate "came onto the market" in Vancouver. Sim Publishing disapproves of the break-up of such libraries, and is disappointed that there is no institution in Vancouver or Canada that is apparently willing to take on the burden (if you will) of acquiring such collections in their entirety for posterity. Given the opportunity, though, Sim Publishing acquired about 100 books and exhibition catalogues from the collection, and immediately sent a list to the National Gallery Library for potential donation. The Library's Bibliographer returned a list of 25 publications that the Library either did not have, or needed additional copies of. All but one of these publications were donated to the Library on August 21, with another couple of additionally acquired volumes added to the donation. The donation included exhibition catalogues and ephemera with many attributions to the Shadbolts from other artists, as well as catalogues of exhibitions of Jack Shadbolt's work, or exhibitions that Doris curated. There were also a few early art books used by the Shadbolts as reference material. Hundreds of books and pamphlets were not acquired by Sim Publishing. They included a large number of literary publications, including many by George Woodcock, a good friend of the Shadbolts. There were also many nature and bird books, books on native art, books on artists in Canada, Europe, and the United States, and art exhibition catalogues dating from as early as the 1920s. Taken together, the collection provided an excellent overview of the work, sources, inspirations, acquaintances and associates of the Shadbolts. Broken into pieces, the former collection provides only limited meaning about them, and it is a shame to have had this happen. Given that it did happen, though, one might like to know that a number of the publications are still available for purchase at Pulp Fiction books, 2422 Main Street, Vancouver. The June 2004 issue of Amphora has been published. 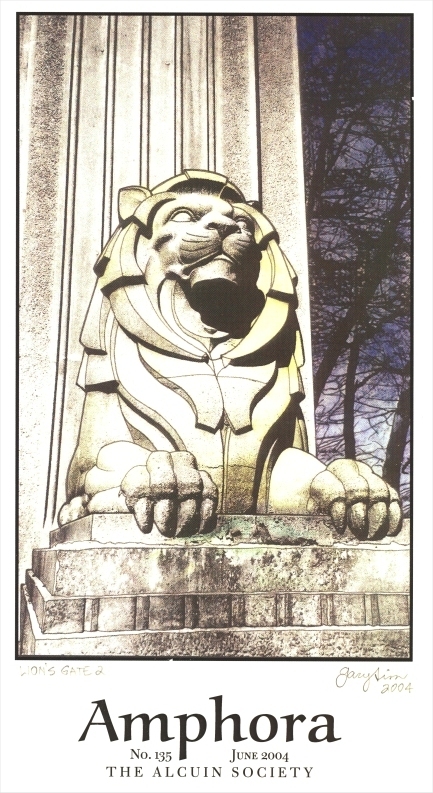 Sim, as the featured artist in this issue, is proud to have the journal's second colour cover, a reproduction of his artwork Lion's Gate 2, an image of the east lion on the Lion's Gate bridge, Vancouver BC. 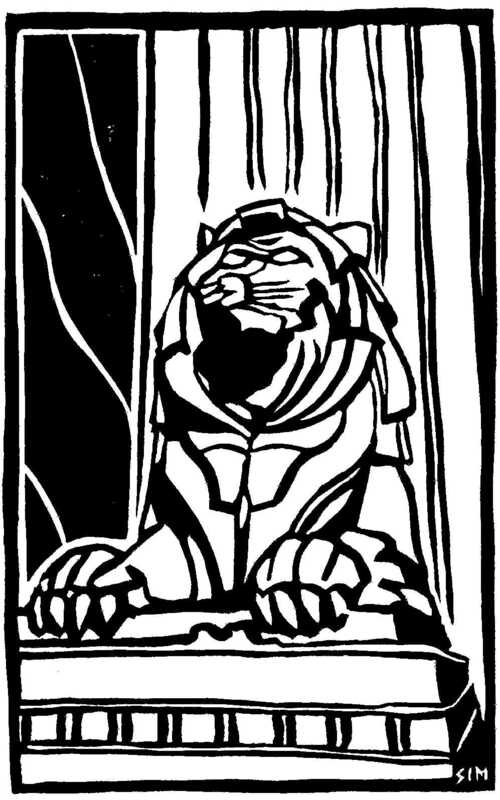 In addition, there are nine other artworks by Sim published in the issue: Lion's Gate 3, Burrard Bridge, Prospect Point Lighthouse, Nine O'Clock Gun, Lawn Bowlers, Savary Island Black Turnstones, Otters on Savary Dock, Marega 23, and Looking Away. Also included in the issue are Sim's first published poem, and a 2600 word article on Antiquarian Booksellers. Rounding out the "sim special" edition, as the Editor calls it, is a biographical page About the Artist, and a very complimentary paragraph about Sim by the Editor Richard Hopkins in his column From the Editor's Desk. Thank you very much for the honour of selecting Sim (me) as a featured artist in your journal. Taking a leap of faith, Sim Publishing put in an absentee bid on an old hand press that was up for auction in Victoria BC at Lund's Auctions, having only seen an online image of the press. After successfully purchasing it, and having it delivered to Vancouver, the press turned out to be in excellent working order. Subsequent printmaking has become much easier and with a much higher success rate. The plate on the press is 12" x 10", which covers the majority of block prints being produced by Sim Publishing to date. 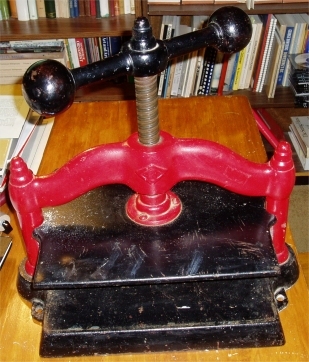 The cast iron press weighs 60 pounds. The manufacturer is not known, although there is a logo cast into the crossbar, a diamond with either a hexagon or a hexagonal G inside it. Any information about the maker, manufacturing location, and date of this press would be very much appreciated. After 3-1/2 years of work in the Vancouver architectural office of Stantec, Sim has accepted an offer of employment with Parallel.AT Services. He will take up the position of Production Manager with Parallel, a position he lost when Stantec acquired another architectural firm in 2003. Parallel offers a variety of services to architecture firms, developers, retailers, and private clients, including architectural drafting, site surveys, and project management. It will be a challenging position, but one well suited to Sim's 16 years of experience in architectural and engineering offices as a draftsman, CAD Manager, Network Administrator, Job Captain, and Production Manager. Michael Kluckner has been compiling information for his upcoming publication Vanishing British Columbia, and posting it on his website at Vanishing B.C. I sent him some information about interesting locations that I came across during my days of working on the B.C. Rail rock gang, and Michael was kind enough to post the information on his web site, including a photograph of my old trusty Toyota pickup truck at Tumbler Ridge. Paula Gustafson, Editor of Artichoke magazine (Writings About the Visual Arts) has written and published a very complimentary book review of Sim Publishing's flagship project, Art and Artists in Exhibition: Vancouver 1890 - 1950. The review is in the Summer 2004 issue of Artichoke, on page 47. Thank you, Paula. A photo taken in 2004 while walking over the Georgia Viaduct from Main Street to downtown. 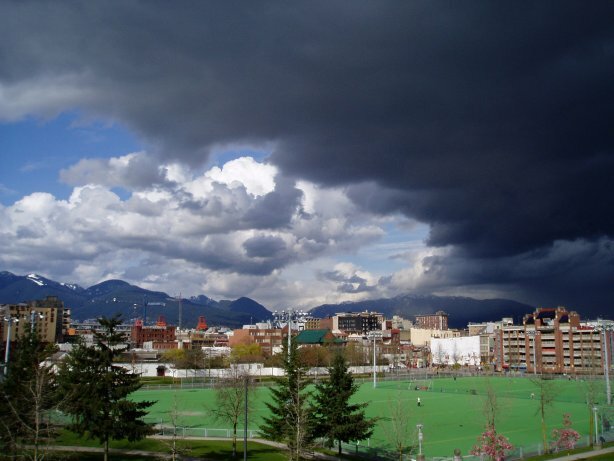 Although it was a nice sunny day in Vancouver, there was a huge black storm system moving in. This photo is resized but not retouched. Gary Sim recently teamed up with Andrew Todd, Conservator, and Letia Richardson, Art Historian and Writer, to put forward a proposal for conservation of the major historic sculpture Spirit of Mining, by artist Beatrice Lennie (1904 - 1987), currently in the collection of the B.C. Museum of Mining at Britannia BC. The proposal was presented in early July, and immediately accepted in principle. The team is now beginning discussions with Museum staff regarding the project, which will need to have funds raised in order to proceed. The project intends to not only conserve and repair the sculpture, but to use the work as an educational opportunity, and to publish a book about the project and the place of the sculpture and its artist in the art history of British Columbia. Anyone interested in supporting this project is encouraged to contact one of the three team members for more information. Nine original pen and ink drawings by Sim are on exhibition at the Daily Grind Cafe, 1500 West Georgia Street, Vancouver, from June 21 to July 30 2004. All works are for sale. The Gallery is open during Cafe hours, 7:00 a.m. to 3:00 p.m. daily, Monday to Friday. All drawings are archivally matted in OPUS exhibition frames. Subject matter includes architecture, nature, and public art. One drawing in this exhibition is the original for the cover of Amphora Issue 135 (see above / below), and three other drawings are published in the issue. The Gallery is open during Cafe hours, 7:00 a.m. to 4:00 p.m. daily, Monday to Friday. Information about the artists and the artworks will be available. Following two months of correspondence and reviews of submitted material, the Editor of Amphora, the journal of the Alcuin Society, selected Gary Sim as the feature artist for the June issue of Amphora, Number 135. The Alcuin Society presents the prestigious annual Canadian book design awards, holds the annual Antiquarian Books Roadshow at the Vancouver Public Library, and publishes numerous books and ephemera in addition to holding seminars and other special events related to the promotion of "finely wrought books among booklovers around the world." The selection is a great honour, and includes the design for the colour front cover, numerous images printed throughout the journal, and a one-page artist's biography. In addition to this, the Editor selected an article by Sim on "the care and feeding of antiquarian booksellers" for publication in the same issue. Recent feature artists published in the journal include Jim Rimmer, Michael Kluckner, and Andrea Taylor. Amphora is available through membership in the Alcuin Society, or by direct order from the Society's web site at www.alcuinsociety.com for $15.00 per issue. Most back issues are available for purchase.